PVA Tube Netting: This top quality, residue-free PVA Netting (5 metres) comes in its own purpose built container. The tube allows for easy filling, whilst the container securely protects the netting. 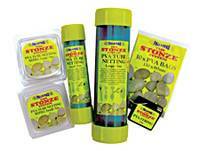 Each tube contains a free Stonze weight (RRP £1.25). PVA Bags: 10 high quality PVA Bags, size 130mm x 80mm, complete in a heavy-duty self-seal bag or protection. PVA String: 20 metres of high quality PVA String housed within a purpose built dispenser complete with cutter. These size 8 rolling swivels fit into our Tulip Beads and Stonze Connectors and are perfect for the Stonze System. 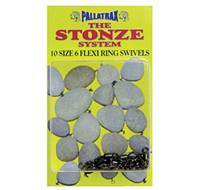 Top quality Flexi Ring Swivels Size 8. 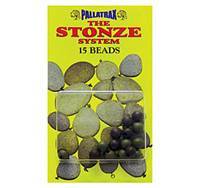 These quality soft rubber Beads are perfect for the Stonze System. Mixed pack of Green & Brown rubber beads. 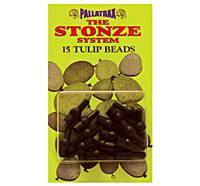 Quality, soft rubber Tulip Beads which are perfect for the Stonze System. 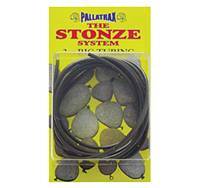 Top quality soft Rig Tubing which is perfect for the Stonze System. 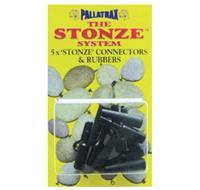 Available in olive and black, each packet contains 5 Stonze Connectors and 5 Rubbers. 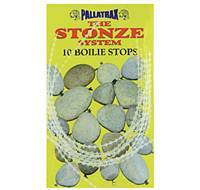 A very simple way of changing your Stonze without re-tying rigs. The tail rubber fits perfectly over the connector and can be used in conjunction with our tubing. The clips are not designed to eject your weight. 10 strips of white Boilie Stops. 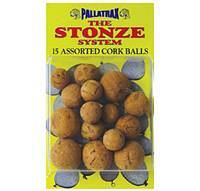 Cork Balls are useful for floater fishing and making pop-ups etc. 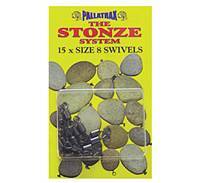 15 per packet 10mm, 12mm, 14mm or mixed (5 of each size). 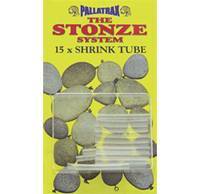 This Shrink Tube with an extremely high shrink ratio is perfect for the Stonze System. 15 x 1" lengths per packet.